If you’re tired of the gym and looking to switch up your exercise routine with something new and exciting, boxing could be a great choice for you. Boxing gyms and boxing based fitness classes are becoming increasingly popular amongst women. Both amateur and professional women’s boxing has made great progress in Europe, the Americas, Asia and Australasia. Boxing workouts for women have amazing benefits such as improving cardio fitness, muscle strengthening and toning, improved reflexes and improved confidence. Trying boxing for the first time can feel quite daunting, but there’s really nothing to worry about! You don’t need to panic about buying loads of boxing gear to start with and there’s no chance of getting hurt in your first session because it will always be a non-contact sport at the beginning, and for as long as you want it to be. If you’re worried about being gawped at, or feeling intimidated by muscley male boxers, find out if there are any female only boxing gyms or boxing sessions near you. You can find information about boxing gyms in the UK and Ireland here. Read on and you may just be inspired to give boxing a try! There are many benefits to starting boxing classes or training sessions for women. Women’s boxing routines are a great cardio workout and fantastic for muscle sculpting. It’s like the ultimate HIIT class, but much more fun! It also improves your reflexes, concentration and hand eye coordination, making you feel ready for anything! Boxing requires a focused mind, so it’s also a form of meditation and is a great way of taking your mind off any stresses in your life. Boxing is really good for the core, as well as arm and leg muscles, because it involves a lot of hip rotation. It will give your heart a great workout, improve your strength and tone your muscles. Not only will you burn fat, boxing helps to speed up your metabolism as well. What’s not to love?! 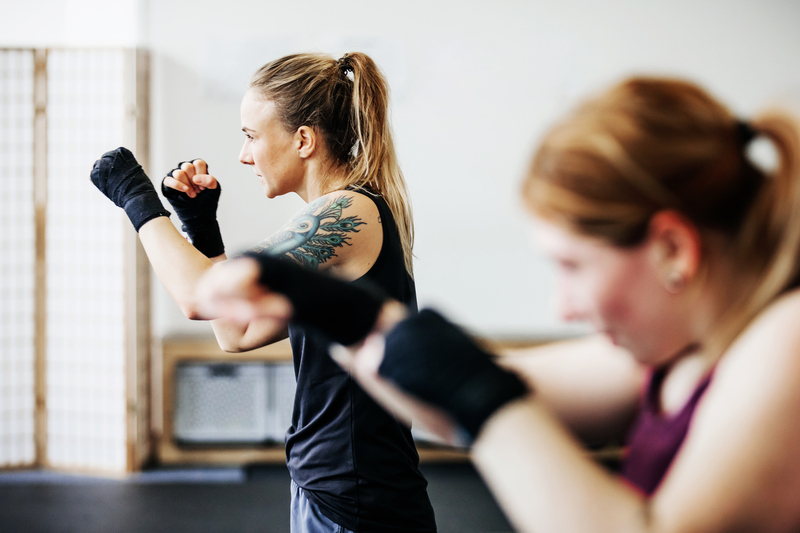 As well as the physical benefits, many women find that boxing makes them feel more powerful and improves their confidence in all areas of their life. You don’t need a whole new boxing wardrobe when you’re first getting started. All you need as a beginner is a sports bra, and breathable and stretchy sports clothes such as t shirts, vest tops, leggings, joggers and shorts. If and when you move onto sparring, you’ll also need boxing gloves and a gum shield to protect yourself. When it comes to footwear, any sort of comfy breathable sports shoes are fine, you don’t need boxing boots right away. First thing’s first, before you can start working through these boxing workouts for women, you need to learn how to adopt the boxing stance. You should stand slightly sideways so you’re not directly facing the opponent/trainer/punch bag. Your chin should be tucked down towards your chest and your elbows should be tucked in. Your lead hand should be around 6 inches from your chin. This allows you to throw fast jabs and to block your opponent’s rear hand. Your rear hand should be guarding your chin. Make sure your knees are slightly bent for flexibility of movement and to increase the power of your punches. Your feet need to be shoulder width apart, with your lead foot in front and your rear foot lifted at the heel. Follow these steps and you’ll be ready for action! Like any workout, boxing training sessions must start with a warm-up. The traditional boxing warm-up is skipping. It’s great for getting your heart rate up a bit before the workout, it warms up your muscles, gets your brain focused and gets you in the zone! Once you’ve warmed up, be prepared to get your sweat on! Boxing isn’t about posing, it’s about getting stuck in and working hard. Boxing workouts don’t have to include sparring or punch bags, but if you move onto sparring you need to make sure you have the right equipment, for example a mouthguard and boxing gloves. We’ll start with a basic boxing routine which doesn’t require any equipment. After your warm-up, get into your boxing stance and then alternate between speed punching for two minutes; followed by two minutes of the jab, right punch, hook, uppercut. You’ll probably find it’s a great way to relieve stress as well as an amazing workout! Repeat a few times during workouts and you’ll soon see the benefits. If you’ve got access to a power ball, either at home or at your local boxing gym, this workout is great for strength and coordination. Ideally you need a 5 to 10 pound ball for this one. Holding the power ball, shuffle from side to side in a circle, changing directions every 15 seconds or so. After a few repetitions, do 30 seconds of squats with the ball. Then start over. This will be quite tough for beginners but you will build up your stamina and each time you try this workout, it will get easier, we promise! Other exercises you can do with a power ball or medicine ball are sit-ups and crunches. Hold the ball and complete the crunches with your arms extended above your chest. You will feel this one on your abs! Use a double-end bag to help improve your reflexes and coordination. Practising your punches on a double-end bag will teach you how to punch a moving target. This is really difficult at first, but with practise your precision and timing will improve and you might even feel ready to get in the ring! Speedbags are great for finishing off your boxing workout. Working out with the speedbag will help improve the speed of your punches and your timing and coordination. It’s also a great workout for your arms and shoulders. Finally, shadow boxing is a great technique to try. Shadow boxing is one of the oldest and most versatile techniques which helps to improve many aspects of your fighting ability. If you watch someone do it, it looks like they’re fighting the air! You might feel a bit silly at first, but remember that all professional boxers have incorporated this into their training. In fact, Muhammad Ali once performed a now famous shadow boxing routine on TV. If you train with a boxing coach or at a boxing gym, this is almost guaranteed to be part of your training programme. Once you’ve got these exercises down you can move onto sparring. But don’t rush it. As with any new exercise, you should start off slowly and build up to more advanced workouts. Initially, your beginner’s workout should be between 30 minutes to an hour long. This will provide you with an amazing workout but be prepared to work up a sweat! Boxing training will leave you feeling energised and you’ll leave the gym on a high. Boxing routines help to alleviate stress and tension and will also release endorphins which will make you feel good. You’ll feel more confident and ready to face any challenges which come your way. Ready to give boxing a go? Start off by finding where your nearest boxing gym or boxing training sessions are. If it’s boxing clothing and equipment you’re after, we’ve got you covered. You can find boxing clothes, boxing gloves and equipment in our WBC and Cleto Reyes official women’s boxing gear range, which will have you fighting fit in no time!